The assets of other financial intermediaries (OFIs), which includes all financial institutions that are not central banks, banks, insurance corporations, pension funds, public financial institutions or financial auxiliaries, grew by 7.6% to $116.6 trillion globally in 2017. OFI assets grew faster than the assets of banks, insurance corporations and pension funds. OFI assets represent 30.5% of total global financial assets, the largest share OFIs have had on record. OFIs’ Interconnectedness With Banks (1) (At end-2017)SOURCES: JURISDICTIONS’ 2018 SUBMISSIONS (NATIONAL SECTORAL BALANCE SHEET AND OTHER DATA); FSB CALCULATIONS. Monitoring Aggregates, (Data as of end of 2017)SOURCE: JURISDICTIONS’ 2018 SUBMISSIONS (NATIONAL SECTOR BALANCE SHEET AND OTHER DATA); FSB CALCULATIONS. The monitoring universe of non-bank financial intermediation (MUNFI) grew by 7.0% to an aggregate $184.3 trillion in 2017. MUNFI’s share of total global financial assets increased for the sixth consecutive year (reaching 48.2%). Monitoring Aggregates, Data as of end of 2017SOURCE: JURISDICTIONS’ 2018 SUBMISSIONS (NATIONAL SECTOR BALANCE SHEET AND OTHER DATA); FSB CALCULATIONS. Investment funds continue to be the largest OFI sub-sector, followed by captive financial institutions and money lenders (CFIMLs). Structured finance vehicles (SFVs) grew in 2017 for the first time since the 2007- 09 global financial crisis. While SFVs grew in most jurisdictions, the global increase was driven by just a few jurisdictions. Aggregate loans extended by OFIs increased by 0.2% in 2017, continuing growth seen since 2011 (in comparison, bank lending grew by 6.2% in 2017). OFI lending grew in some Asian jurisdictions, offsetting declines in some euro area jurisdictions. OFIs have continued to reduce their reliance on wholesale funding and repos as a source of funding,4 while that of banks has changed little since 2011. The total repo assets of banks and OFIs grew by 9.6% in 2017 to reach $9.4 trillion, while their total repo liabilities grew by 9.8% to reach $9.2 trillion. Among OFIs, money market funds (MMFs), trust companies and investment funds are net providers of cash through repos, while broker-dealers are net recipients. In aggregate, banks and OFIs have become marginally more interconnected through credit and funding relationships in 2017, remaining around 2003-06 levels. Investment funds and MMFs are the largest OFI sub-sectors that provide credit to banks. OFIs have significant cross-border linkages relative to their assets. − Collective investment vehicles (CIVs) with features that make them susceptible to runs (EF1) grew by 9.1% in 2017, less than in 2016 (9.9%) or from 2011-16 (13.2%). EF1 entities include open-ended fixed income funds, credit hedge funds and MMFs, and their assets represent 71.2% of the narrow measure (see Exhibit 0-1). CIVs in EF1 invest mostly in credit assets (e.g. for fixed income funds and MMFs, reflecting their business models) and are involved in liquidity transformation. 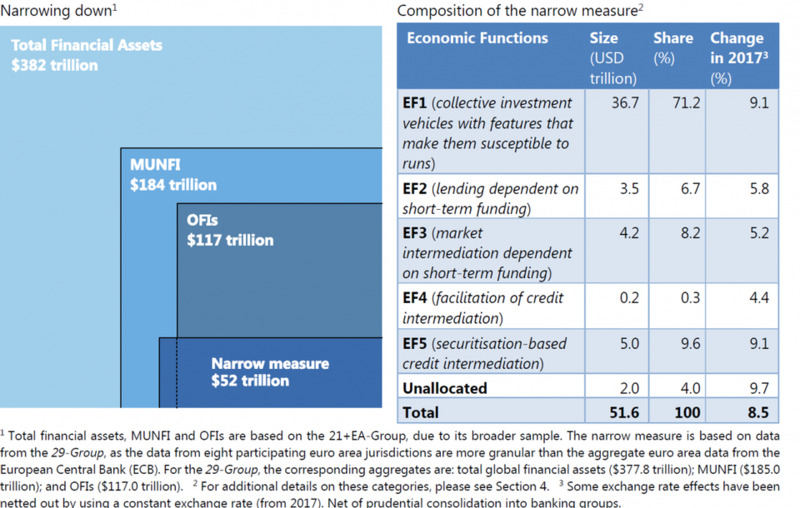 − Non-bank financial entities engaging in loan provision that is dependent on short-term funding (EF2) grew by 5.8% in 2017, to account for 6.7% of the narrow measure. Finance companies, the entity type most commonly classified into EF2, employ a somewhat elevated degree of leverage and, in some jurisdictions, a high degree of maturity transformation. Finance companies in a few jurisdictions displayed high liquidity transformation. − Market intermediaries that depend on short-term funding or secured funding of client assets (EF3) grew by 5.2%, to make up 8.2% of the narrow measure. Broker-dealers constitute the largest EF3 entity type. 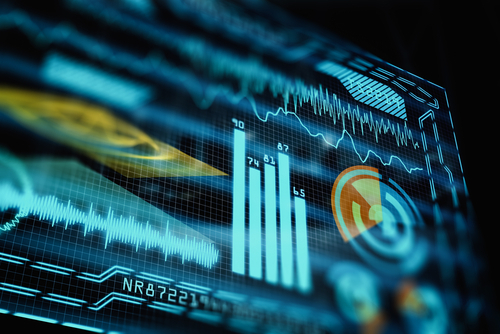 Reflecting their business models, broker-dealers in some jurisdictions continue to employ significant leverage, particularly when accounting for off-balance sheet exposures, although it is considered to be lower than the levels seen prior to the financial crisis. Net repo market funding of broker-dealers increased in 2017, after several years of reduced repo market funding. − Entities involved in the facilitation of credit creation (EF4), such as financial guarantors and credit insurers, grew by 4.4% in 2017, although their current size ($173.4 billion) is likely quite understated due to the difficulty in capturing their off-balance sheet exposures. Risk data were also sparse. − Securitization-based credit intermediation (EF5) increased by 9.1% in 2017, to account for 9.6% of the narrow measure, primarily driven by growth in trust company assets and securitizations.